I know I don't wear a ton of color or prints, but isn't this romper just darling?? I love that it's a natural looking floral print, does that make sense? It's by BB Dakota and I recently realized how many of their pieces I'm loving lately (this romper definitely included!). There's a great selection at Shopbop that I've been browsing lately! I mentioned this in my June Wish List post, but I'm back in love with rompers, and love how easy they make it to get dressed. I also think they look adorable with a little denim or cargo jacket, or long cardigan layered over the top, which means they will be perfect for our upcoming California trip! Speaking of denim jackets... 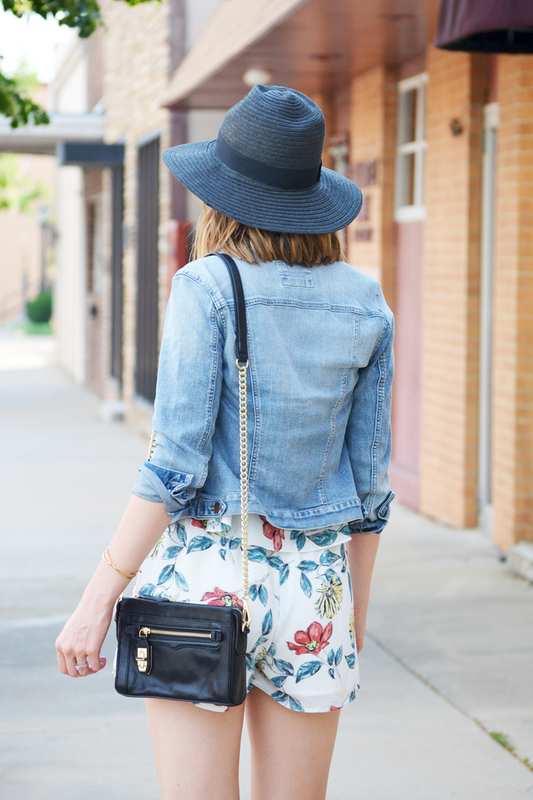 I recently purchased this jacket from LOFT and it's the perfect denim jacket! I've been looking for the right fit and comfort level for awhile, and this was the perfect match. The torso is slimming, and the sleeves have just the right amount of stretch so that you're still comfortable and can actually move (seriously, why are most denim jackets so freaking stiff?! ).